Our attention has been drawn to the fake group known as Igbo For Nigeria Movement, INM. According to vanguard news online, "the group has called on the entire Ndigbo to bury the idea of the struggle of the Republic Of Biafra and embrace the new platform, INM for intellectual and strategic engagement that would enthrone equity, fairness and justice to every member of the Nigeria state". This is coming barely two days to the SIT AT HOME as directed by the leader of IPOB, Mazi Nnamdi Kanu. This is not the first time Nigeria and their gutter Yoruba Media is creating fake Igbo groups. We still remember TRIPOD, RE-IPOB and others. There have been relentless efforts by the Nigerian government to hinder or scuttle the Biafra restoration project. They have created many fake groups of which most of them are non existent and are faceless, yet IPOB is not deterred and has remained focused. The name Biafra is resonating not just in Nigeria but all over the world where Biafrans inhabits. 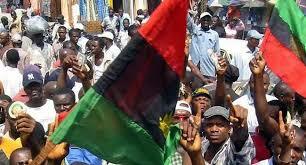 To a great extent Biafra issue has taken over Nigeria political discuss and has also become a burning national issue. The emergence of this recent fake Igbo group is as a result of the effect of the Biafra issue burning in all the facet and fabrics of the Nigerian state. Meanwhile, IPOB is prepared for the journey for Biafra freedom, so all the antics the Nigerian government may put in place or employ will be matched with a fierce and unequal reaction or proportion. IPOB is not unaware of the presence of some unscrupulous elements within the rank and file of IPOB that might fall prey in the dirty hands of the Nigerian state which might be used to cause disaffection and creat doubts in the minds of some gullible Biafrans. On this note, Family Writers wish to inform all well meaning Biafrans to disregard, discountenance and dissociate themselves from this non existent group and other faceless groups that might sprout out in future. However, when you start hearing news like this fake groups sprouting out, know that we are giving them sleepless night, and for sure Biafra is at hand. IPOB is not deterred and is equal to the task as they dismantle this Lugardian edifice- Nigeria. Therefore, 30th May remains our heroes remembrance day and SIT AT HOME is still very much intact as directed by our leader Mazi Nnamdi Kanu. And Biafrans in the whole Biafra Land and other part of Nigeria has been appealed to adhere to the SIT AT HOME which will eventually serve as a veritable roadmap to Biafra restoration. We will shame them all as we match relentlessly forward to restoring Biafra, our lost identity.